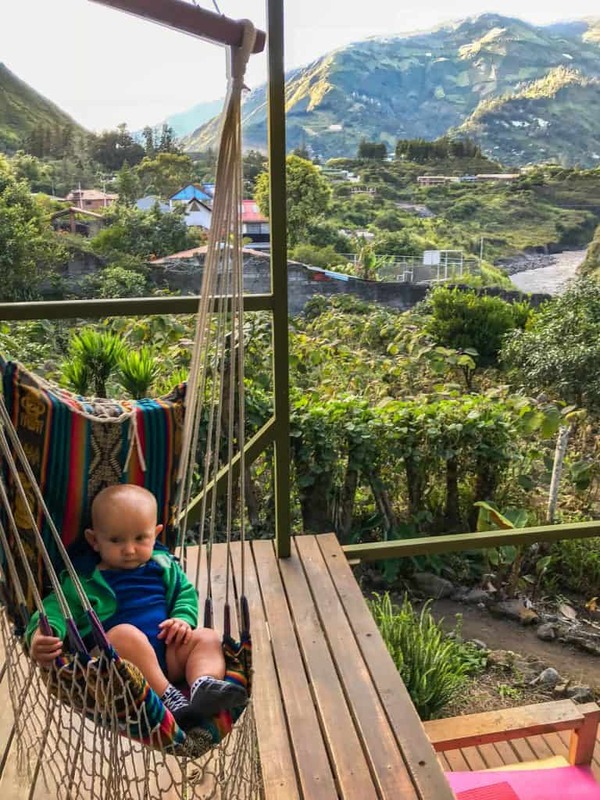 The truth is, I was looking for the swing off the end of the world in Banos, Ecuador with kids. You know, the one that was circulating all over Facebook? 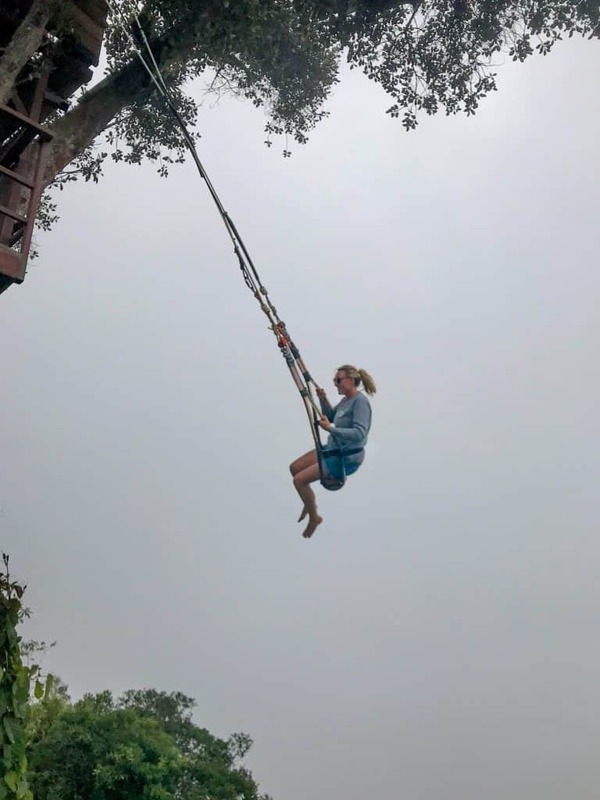 The video of people on a massive tree swing that literally goes out over the clouds, with a volcano backdrop? I hadn’t expected to find such incredible wonders of nature on our search. A beautiful winding canyon, for miles, with lush green grass and gushing waterfalls around every corner. Based high in the Andes and at the gateway to the Amazon, I hadn’t realised Banos was so set up for tourists. There is so much infrastructure, from road trains, to zip lines across the canyon. The little town has many restaurants, a town square and is surrounded by mountainous views. We drove from Quito to Banos (we rented our car from rentalcars.com), it took just a little over three hours, the roads are surprisingly good, cutting through mountains and past small villages, it’s incredibly scenic along the way. On approach to the town, there are many people out on the road, selling tall sugar canes, others trying to flag us down for business. I’ve heard tourism has dropped recently. Locals say its because people are choosing to go to Galapagos, or they also think its because of the Venezuelan refugee crisis. Either way, they feel tourism is suffering. 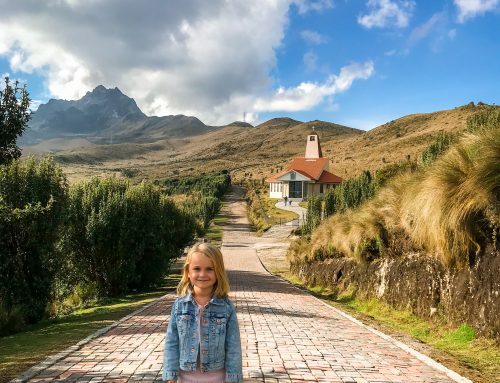 I find it crazy because it’s such a stunning part of Ecuador that cannot be missed if you visit. I was so impressed by the farming conditions. Despite the vertical drop, there were many vegetable farms on hill sides. I did wonder how they managed to look after it. I loved the local customs and traditions, especially the women’s attire. In Banos, you will see them wearing shawls, the original Panama hat in brown, long skirts and tights. I found the native people shy, but always had a welcoming smile. 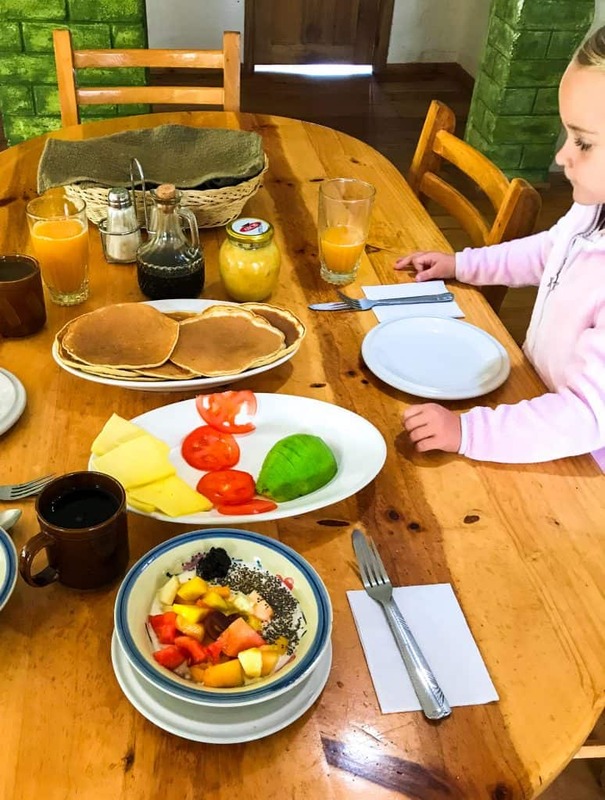 Here is our sleep, play and eat guide to Banos, Ecuador with kids. It’s safe to say there is no shortage of beautiful waterfalls in Banos. The one road along the opposite side of the canyon provides the perfect view. It’s clearly marked out on all of the tourist map as a route to take for the scenic drive or cycle. The waterfalls are absolutely stunning. We decided to drive with the kids as they are too young for bikes at the moment. At one point we were driving under a waterfall. The cyclists were loving it as a way of cooling down from the hot day. 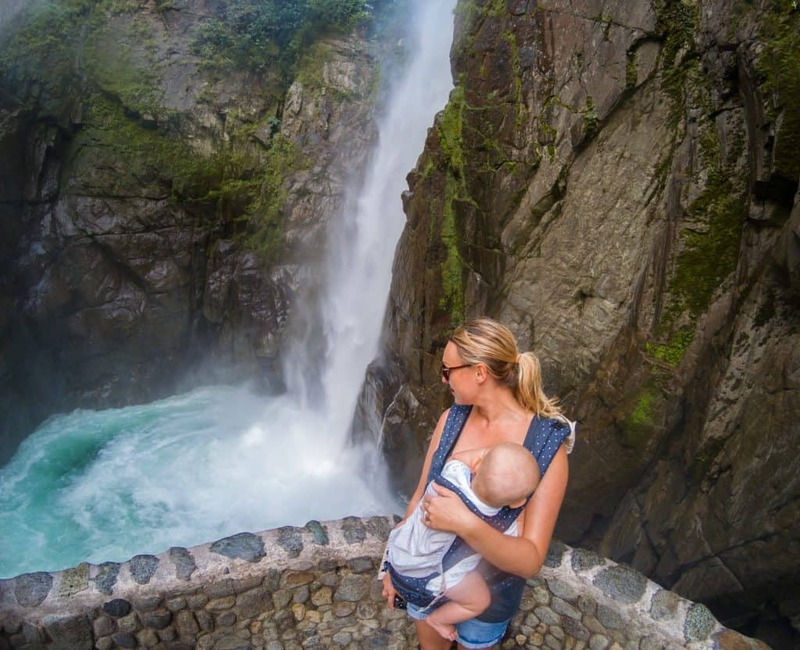 The biggest and most impressive waterfall, Pailon Del Diablio, is a lot more hidden. It’s a good thirty minute downhill hike from the second last stop on the map. There is parking near the entrance of the walk and I would suggest, if little legs will give up at some point, its best to have a carrier. For some reason it took us twice as long to walk down than back up the hill. It’s probably because we were wearing flip flops. One mistake we made was doing the hike on a Sunday. Most of the crowds were local Ecuadorians. I imagine we would have the place to ourselves if we went the following day. There is a restaurant very close to the end of the walk, it’s the ideal spot for lunch and to take in the views. The suspension bridge next to the restaurant provides a birds eye view of the jaw dropping, thunderous waterfall below. It’s not for the faint hearted. I took a quick peak after our lunch before continuing on to see the waterfall from below. There is a steep set of stairs that wind around the edge of the fall. The area is constantly getting soaked from gusts of winds thrusting the waterfall across spectators. Hubby and I split for a while so he could take the more daring and drenching path around the back of it. I attempted with Quinn on my back and quickly back tracked when I realised what was in store. 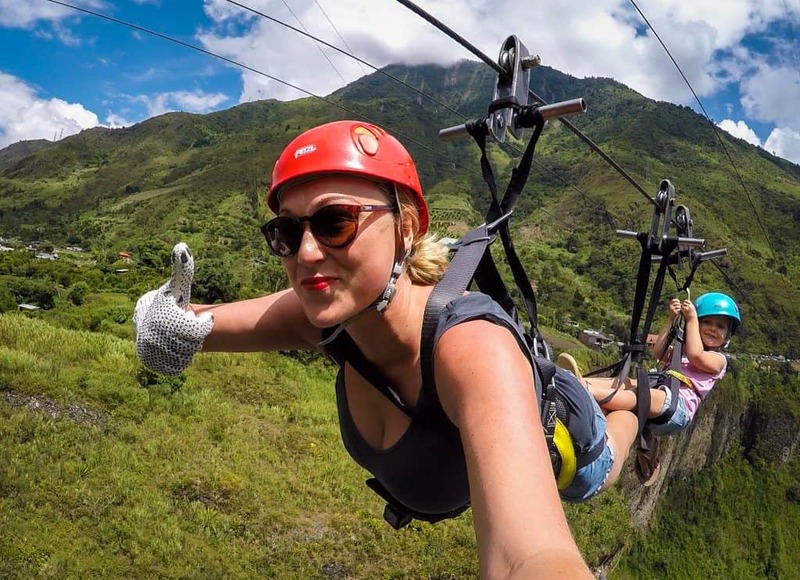 I absolutely love zip-lining and there are many in Banos! Literally, the first one I saw on the scenic drive around the edge of the canyon, I asked Travel Mad Dad to pull up. Esme was straight into the office getting rigged up with the gear so we went together. It was Esme’s first ever zip, so I was a little more nervous than usual. I was facing down and she was just behind me. It was an interesting zip ‘rig-up’ to say the least. 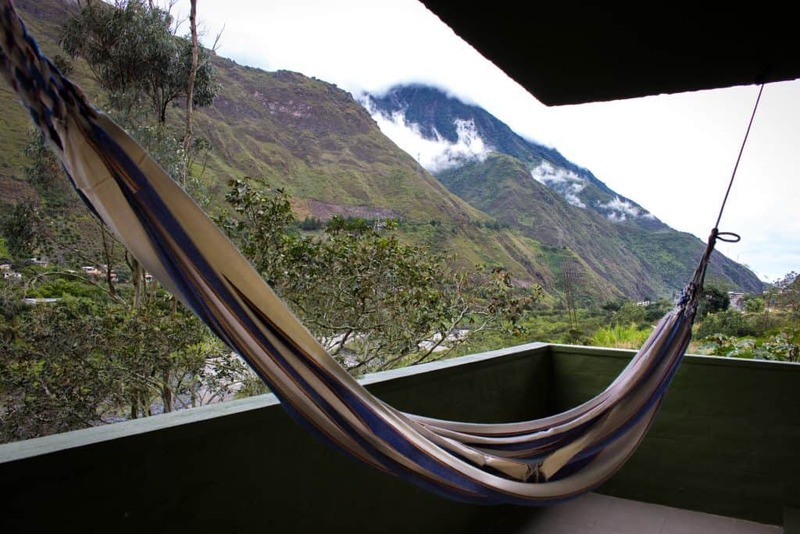 Again, what I love about all of the activities in Ecuador is, its super affordable. For both of us to zip over the most dramatic part of the canyon and come back on the lift was only 20 USD. I felt that was a bargain considering a lot of places charge more than 50 sometimes. I can’t believe there are so many amazing things to see in Banos, but it was Casa Del Arbol tree swing that put it on my radar. The power of social media, hey! Its around an 8 km drive up hill from downtown Banos. It only costs a couple of dollars to get in and there are many different swings, not just the tree house one. Some are more suitable for kids than others. We arrived at a time when there was hardly anyone else around. It wasn’t long before a tour group turned up, so I was glad we got to go on the swing before other people arrived. It was super clouded over but it was still impressive and it really did feel like I was swinging off the side of the edge of the world! Back at the entrance, next to the car park, there is a lovely cozy cafe. They have the log burner going and warm drinks. 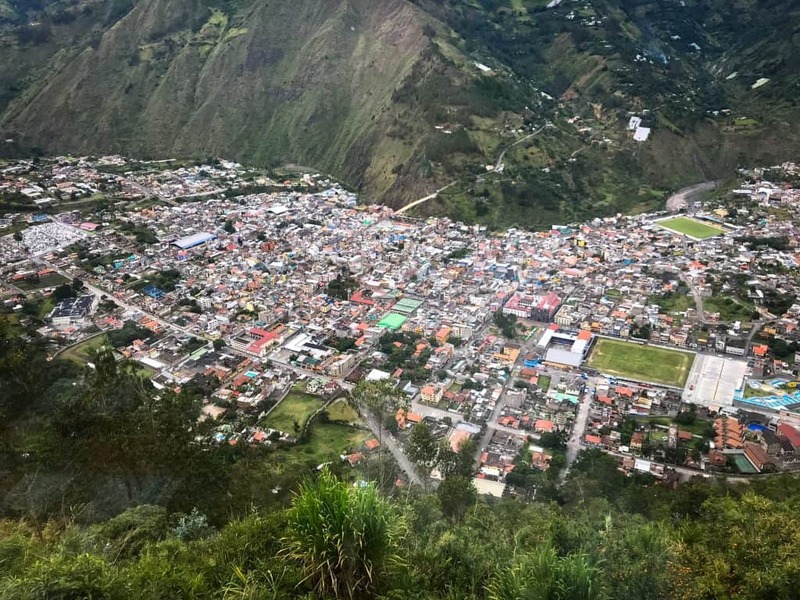 The views over the valley are one of the best in all of Banos. Still looking for more inspiration. Check out this article on the best things to do in Banos! We stayed at the highly commended and recommended, La Casa Verde, which means The Green House. Being an eco lodge, the colour scheme and lush fruit and vegetable garden onsite was very fitting. 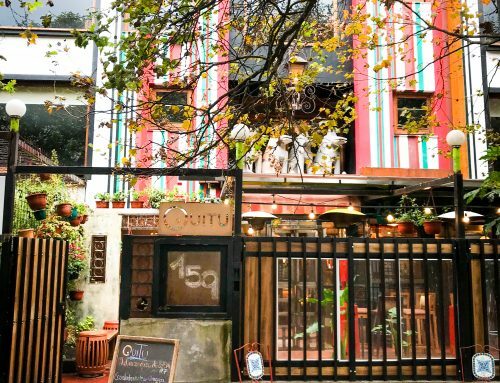 Although its owned by an Kiwi women, its run by the sweetest local family Ange and Johan, mother and son. They are very welcoming and helpful with activities. 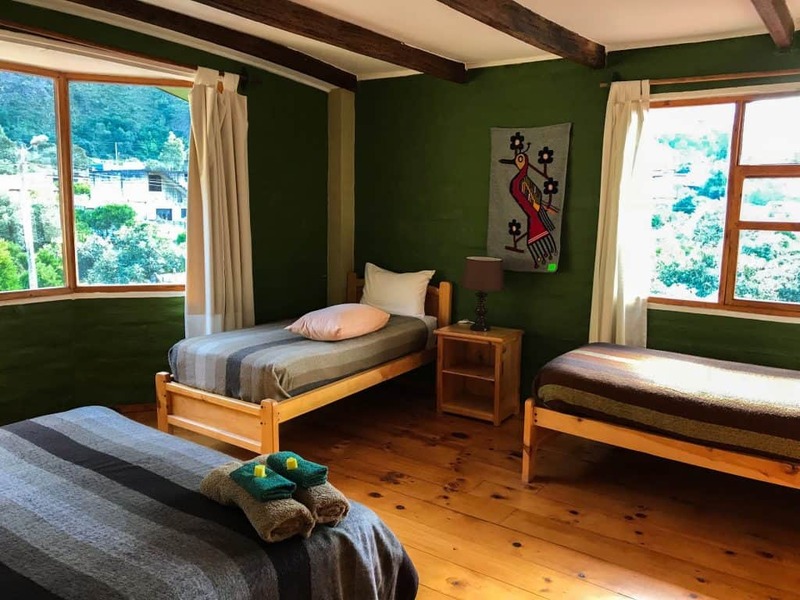 Its just a few minutes out of town on a quiet residential street and has some stunning views of the rapid river and rolling mountains. We felt so cozy, especially when it was raining in our big family room. Complete with local tapestry wall hangings, handmade traditional bed quilts and some serious scenery from the window. I loved the simple but healthy and tasty breakfast. They had an array of seeds, dried fruits and oats. The fruit from the garden was so fresh and made it all the more special because it was home grown. The fresh thickly sliced bread with an array of spreads and coffee set us up perfectly for a day of site seeing. The kitchen in the dining room can be used at any time so when our kids were tired, we quite often made lunch at La Casa Verde. Likewise, sometimes we just chilled swinging in the hammock soaking up the views. Ange, the La Casa Verde manager, makes organic soaps, shampoos, body washes and conditioners. They are all made with natural ingredients like cacao, almonds and so on. I sampled a couple that she kindly gave me and it was so nice to put pure natural, absolutely zero additive products on my skin. I told her she needs to export them! If you’d like to book La Casa Verde you can do so here! Like I mentioned, we often had quite a big day as there was so much to do in Banos We only at out a couple of times. By recommendation, we visited Cafe Hood because it has lots of vegetarian options. The cuisine ranges from Thai to Indian and Mexican to European. I had the vegetarian curry which had chickpeas, vegetables, rice and some really tasty sliced mango. We had lunch one afternoon at Lunaruntun Cafe on the hill. It’s on the way to Casa Del Arbol, so if you can tie the two together, perfect! The views of the town and the valley are exceptional! 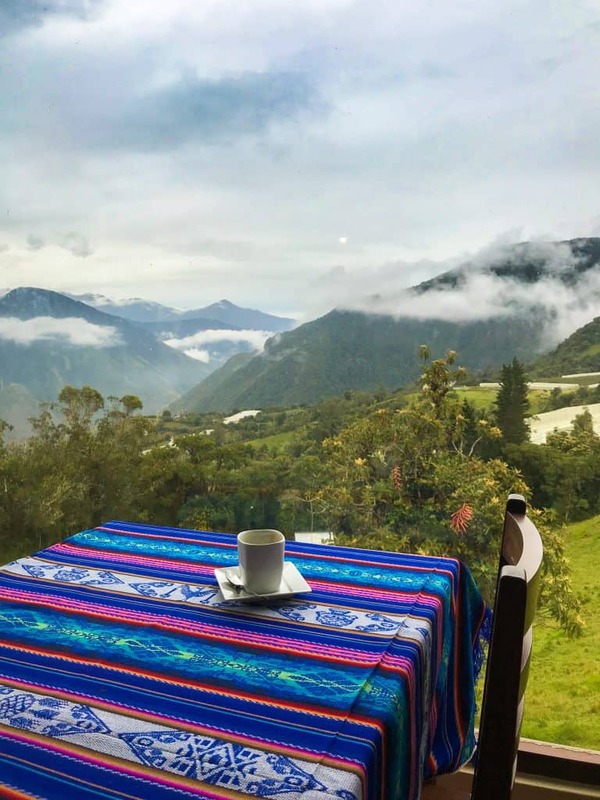 The menu is not too extensive but the coffee’s and views more than made up for it. They also have spa pools, but unfortunately, kids have to be over 8 years old. It could be a good date afternoon if there was a babysitter available. Ready to book your trip? 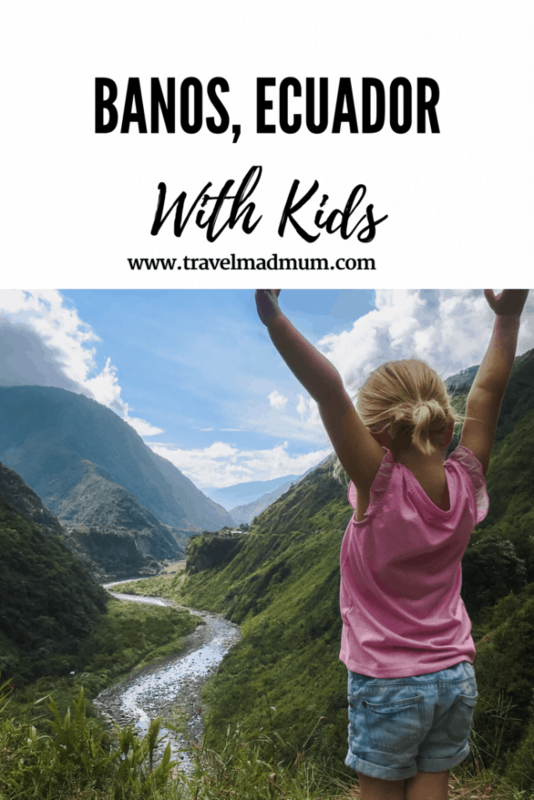 Find the best deals on travel health insurance, hotels and rental cars or check out our best tips for flying with your baby or toddler! 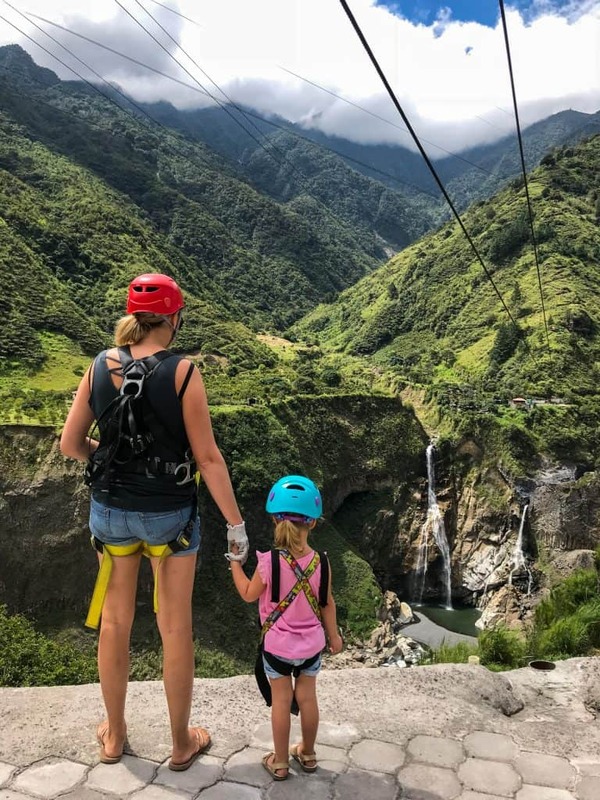 Have you found Banos, Ecuador with Kids useful? If we’ve helped you in some way, we would love if you could help us too. In this digital age there is a demand for immediate information online. Being a patron is a new-age way of giving a small token of appreciation for this information, which takes time to put together, with no financial return. We offer exclusive access to blog posts before they are published as a thank you. We also offer travel advice and consultancy at different payment tiers. You can sign up to our Patron program here. Disclaimer: There are affiliate links in this post. Read my explanation of what an affiliate link is here and how it can help us. 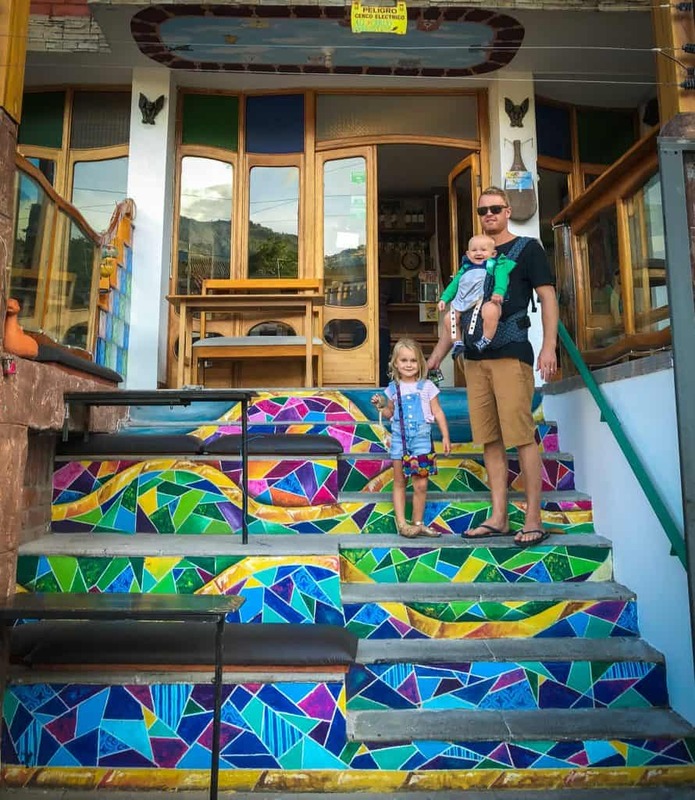 Our stay at Casa Verde was complimentary in return for an honest review. amazing tips and great details on your trip. I look forward to follow more of your travels.